This piece is for sale, available for immediate delivery. In the late 1800s, Japanese prints became the “latest thing” in America. Frank Lloyd Wright and Harvey Ellis both enjoyed and collected prints, and the influence of this aesthetic can be seen in the work of numerous designers of the American Arts & Crafts period of the early 20th century. This carving is based on a print by Hiroshige titled “Horikiri no hanashōbu” (Horikiri iris garden). The frame measures 10-1/8″ wide X 15-1/8″ high, and the carved panel is 5″ x 10″. 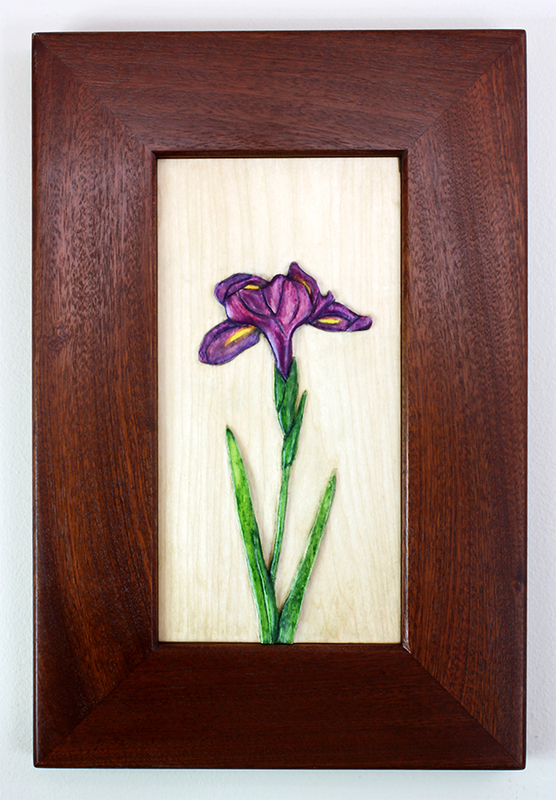 The iris is hand carved in solid basswood and the frame is solid Sapele, often called African Mahogany. The coloring on the panel is light-fast watercolors, and the frame is dyed. The entire piece has a durable, low-sheen lacquer top coat. Like my other carvings this piece presents art that was originally two dimensional in a three dimensional form. These pieces are carved and colored by hand and were inspired by furniture produced at the Byrdcliffe Arts Colony in the early 1900s. Click here for other posts about my fascination with Byrdcliffe carved furniture. This carving is available for $175.00 + $17.90 for Priority Mail shipping within the United States. If you live outside the US, please e-mail before purchasing to receive a quote for shipping.